The horror community lost a true legend last summer when visionary filmmaker George A. Romero passed away at the age of 77. With the 40th anniversary of the iconic movie, Dawn of the Dead, approaching this weekend, Romero super fan Christian Stavrakis knew that he had to do something for the three-day Living Dead Weekend, which is held at the Monroeville Mall in Pittsburgh. Stavrakis decided that he was going to sculpt a bust of Romero to place on display permanently at the Monroeville Mall. Much of Dawn of the Dead was filmed at the mall and fans often head there to take a peek at where it all went down. Since it's the 40th anniversary of the film, Christian Stavrakis made it his mission to deliver the bust by this weekend for the Living Dead Weekend. He started an IndieGoGo campaign, entitled Monroeville of Bust, to cover the $18,000 it was going to cost him to make it. Sadly, the campaign ended with about half of the original goal. But that isn't going to stop Stavrakis from delivering the sculpture of George Romero. Christian Stavrakis started the sculpture, which is about 20 inches tall and weighs 60 pounds, back at the end of January and has pretty much worked on it every day since then. In addition to his day job, Stavrakis also runs Cryptic Pictures, which is directly inspired from the times that he spent as a kid on the set of Romero's Knightriders, where he remembers George Romero's deep laugh and giant teddy bear personality. Stavrakis would work his day job for 10 hours a day and then work on the bust until he passed out, often in the wee hours of the morning. Christian Stavrakis fashioned the bust of George Romero after a picture of him smiling broadly on the 1978 press night for Dawn of the Dead because he thought it was a picture that summed the horror icon up the best. Initially, he sought the help of true professionals to help him sculpt the bust, but in the end, it was just too expensive. He had this to say. "The prices were sky high, and that was fair, because these guys are very good sculptors. Then it sort of dawned on me, so to speak, that I should do it myself because I knew George, and it was sort of a farewell from me, personally." Stavrakis ended up finishing it all on his own, but now he's in some debt for taking on half of the cost on his own. As previously noted, this is not going to stop him from making it to the Monroeville Mall this weekend to celebrate Dawn of the Dead and the life of George Romero. 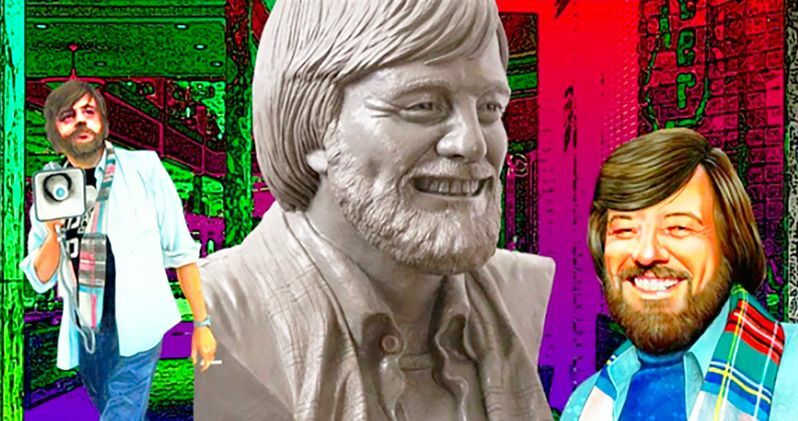 The bust of George Romero will be unveiled at the Monroeville Mall this weekend, June 8th through the 10th, no matter what. However, it is not clear of the sculpture will be permanently stored at the mall as of this writing. It is abundantly clear that Christian Stavrakis is forever in debt to Romero. Stavrakis had this to say about Romero's lasting influence. "George was a father of the Pittsburgh film industry and much of independent film in general." Though Monroeville or Bust campaign wasn't 100 percent successful, Stavrakis is keeping his promise to pay tribute to one of his biggest influences. You can still check out the IndieGoGo campaign and might even be able to donate money. If not, hit up Christian Stavrakis this weekend at the Monroeville Mall and buy him a beer or something.